This is huge. We have discovered the true essence of tea. This tea concentrate is an honest-to-goodness lightning bolt of flavor. Add a splash to your favorite sparkling or mineral water to kick it up a notch; we’ve captured the unflinching spirit of our teas! Just add water - or lemonade! Description: A fruit-lover's infusion. 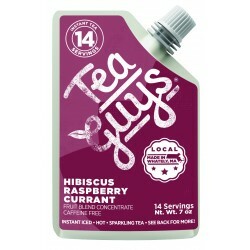 This mélange of hibiscus and berries offers an aromatic and vibrant cup, with a lovely, deep ruby glow. Enjoy warm, or, for warm weather treat, chill and serve over ice with fresh sprigs of spearmint. The definition of refreshing! Naturally caffeine free. Ingredients: an infusion of (water,hibiscus, elderberries, black currants, flavors, raspberries, blueberries ), cane sugar, lemon juice, sea salt, citric acid. Directions: Just a tablespoon! Most beverages require about a tablespoon of brewed tea concentrate. Hot Tea: mix 1 tbsp concentrate with 1 cup of hot water. Sparkling Tea: mix 1 tbsp concentrate with approximately 12 oz sparkling water. Serve over ice. Cream Soda: mix 1 tbsp concentrate, 2 tbsp light cream and 8 oz seltzer or sparkling water. Stir vigorously until froth forms. Milk Tea: mix 1 tbsp concentrate with milk. Stir well. Serve chilled. Smoothie: mix 1 tbsp concentrate with 1 part ice and 1 part water. Blend until smooth. For added body and nutrition, add milk or yogurt, orange juice, kale, spinach, turmeric, powdered flax seed, etc. Don’t be afraid to experiment! Pour over yogurt, ice cream or fresh fruit.